I have taught the encaustic technique from my studio for the last 13 years to hundreds of students. Although I have had students from many countries participate in my encaustic workshops, not everyone can find the time to fit travel in their schedules to advance their encaustic techniques. So, I have created 11 online classes that you can download at your convenience. These classes are directed to those who already have some experience with hot wax painting. This is an encaustic workshop like no other. I happily share my techniques that I personally teach and use. The classes are personal and detailed. It is just as if you are standing next to me in my studio in a private class. In these classes you will learn facial proportions, how to draw features and use 10 different techniques in creating a realistic face. I will show you how to produce faces in pencil, charcoal, chalk pastel, oil, acrylic, textured cold wax and other cold wax techniques, ink wash and ink pencil. 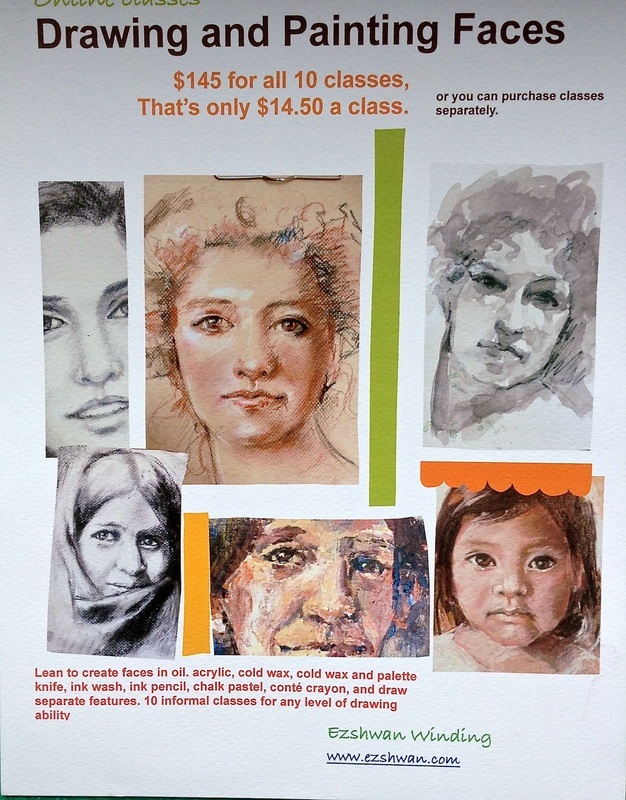 Each class can be purchased separately or you can buy and download all 10 classes for $145. By working online, artists anywhere can participate.